You are here: Home / Law School Admissions / Which Law Schools Are Splitter-Friendly? Which Ones Aren’t? 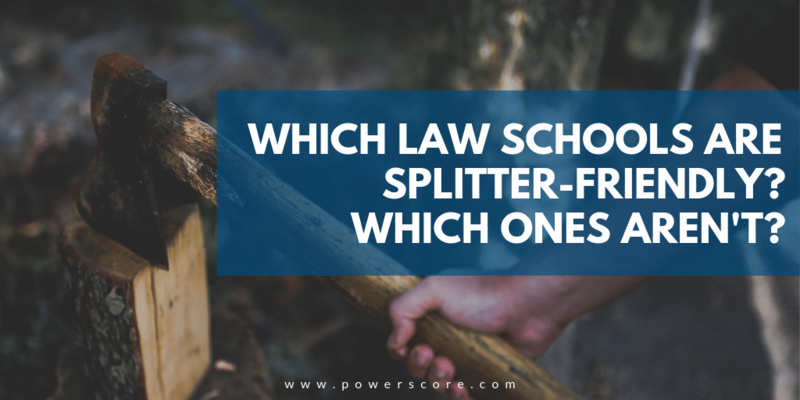 When you discuss law school applications, the question of which schools are “splitter-friendly” comes up pretty often, and it’s not really an easy question to answer. Are we looking for schools to which a high percentage of splitters are admitted relative to non-splitter applicants? Schools that seem to value an applicant’s LSAT score much more than his/her GPA? How about schools that are willing to go really low on the GPA scale to nab those high LSAT scores? There is actually a lot of overlap between those questions, but they’re not all the same thing. There is a ton of anecdotal evidence out there, but the point of this blog is to try to get to the bottom of what the numbers themselves can tell us. With the “splitter friendly” question, it’s not all that easy. By the way, if you’re not sure what a “splitter” is, then make sure to check out Dave Killoran’s post that breaks it all down: What are Splitters, Reverse Splitters, and Super Splitters? And, if you know what all of those terms are and know you are actually a Reverse Splitter, see our article about Reverse Splitter Friendly schools. What I have done here is try to create an index number that incorporates information to answer our questions. The table below shows the index and the data used to compute it. I have to stress that because there is so little data available, and especially little data available on URM applicants, the following applies to non-URM applicants only. It is based entirely on non-URM applicant data. Unfortunately, I had to exclude URM data because it can really skew the overall picture. I also excluded any schools I did not feel that I had sufficient data-points for analysis. LSAT Bump. A number from my own regression analysis, and indicates the % increase in the likelihood of admission for each additional LSAT point an applicant has. GPA Bump. The GPA equivalent of the LSAT bump (the % increase for each .10 GPA). 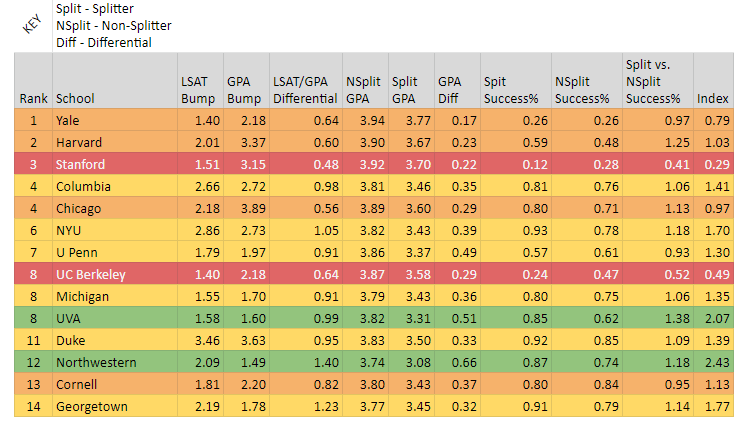 LSAT/GPA Differential. To measure the relative importance of the two, we divide the LSAT Bump by the GPA Bump. The higher the number, the more relative weight the LSAT has. Non-Splitter GPA.The average GPA of admitted non-splitter applicants. Splitter GPA. The average GPA of admitted splitter applicants. GPA Differential. Simply put, this is the difference between the previous two categories, and gives an indication of how much lower on GPA a school will go compared with its average in order to chase high LSAT scores. Splitter Success. % of splitter applicants in the data who were accepted. Non-Splitter Success. % of the non-splitter applicants in the data who were accepted. Splitter vs. Non Success. This is Splitter Success divided by Non-Splitter Success, and gives us a measure of how splitters fare vs. their non-splitter counterparts. If a school admits splitters at a higher percentage than non-splitter, the number will be greater than 1 (and if the opposite is true, it will be less than one). The higher the number, the greater indication that the school is splitter-friendly. Index. This is the number I devised to take into account the salient data from the other categories. It is simply (GPA Differential + LSAT/GPA Differential) * Splitter vs Non Success. The higher the number, the more splitter-friendly a school is. Neutral-Friendly: These schools have an index number that is between the mean and one standard deviation above. Neutral-Unfriendly: These schools have an index number that is between the mean and one standard deviation below. Splitter Unfriendly: These schools have an index number that is more than one standard deviation below the mean. Stanford and Berkeley were more than two standard deviations below the mean, as you can see. The neutral-friendly and neutral-unfriendly categories make me a little squeamish. Since they are all within one standard deviation of the mean, they’re all pretty average. In the end, I decided it was better to distinguish between the above-average and below-average middle, just to give readers a relative comparison. Remember, this is categorizing schools by their relationships to each other. As you can see, there’s not a whole lot of splitter love. In the grand scheme of things, going on in the Top 14, and in general there is a lot more towards the middle/bottom of the Top 100. Still, just as we can compare all the schools among themselves, we can isolate the Top 14 and do the same thing. And since someone is surely interested in how that shakes out, why don’t we just do it right now? Northwestern and UVA are the only schools we could call splitter friendly (again, compared only to the other Top 14 schools), and Columbia, NYU, Penn, Michigan, Duke, and Georgetown all fall on the friendly side of average. This – combined with the relative splitter-unfriendliness of the California schools, more or less confirms the conventional wisdom you hear thrown around, but I guess I should stress once again that there’s really not a whole lot of splitter friendliness in the T14 (outside Northwestern and UVA, I’d say). As always, please keep in mind that this analysis is based on numbers taken from publicly available applicant-reported data (which I have cleaned to make as accurate as possible), and does not come from the law schools themselves. In other words, I wouldn’t look at any of the numbers in this table as perfect representations of reality, but it does make for interesting comparison and reflection, and hopefully is of some use to those pondering applying to law schools. Any possibilities that you guys could do the same exercise for Canadian schools? Thanks for the question! I’ll talk to Daniel about that, but I believe the reason we did not include Canadian schools was that we don’t have access to the same data for those schools. I know where you are coming from though, and we would love to be able to produce the same analysis. I work with a lot of Canadian students, and it would be tremendously helpful to have similar info. We’ll do what we can, but unless the data has changed, it will be difficult. Unfortunately, as much as we would love to do this for Canadian schools, we just don’t have the data. Sorry! As a pretty severe splitter who applied during the last admission cycle, this definitely reflects my experience with the T14 schools. Hi Daniel, have you guys done a similar analysis for reverse splitter friendly schools? I am a reverse splitter (163, 3.88)and I would like to figure out what admission chances do I have within T14. Thans! Great question, and actually Daniel is working on that right now! So, we hope to post that this week if possible. If you are subscribed to our blog (see the right column, near the bottom where it says, “Sign up for blog updates by email and never miss a post!”), you’ll get the notification when it posts (and no spam–we never sell email lists or send you unsolicited email). Hello Dave, I got a question for you, maybe you can help. As I previously posted I’m a reverse splitter, took the June and September Lsat and scored 163 then 161. I would love to improve my lsat score, thing is I’m afraid I am going to score in the same low 160 range, even though I’ve done a lot better during PT, 170-172.If I’ll take Feb lsat and let’s say I’ll score 160 or 161, do you think law schools will still consider my highest, even though I’ve scored on a descendant curve? I’ve read different opinions about the subject, I’d love to hear your input on the matter. Thank you! Thanks for the question! This one is easy: only your high score matters! This article might help: http://blog.powerscore.com/lsat/considering-an-lsat-retake-heres-what-th…. I’ve talked to multiple law school deans, and all have agreed with the comments in that blog. As my friend Mike Spivey, former assistant law dean at Vanderbilt and WUSTL, says in the article, “the high score means everything and the only thing to a school’s median LSAT and rankings, and all other scores/takes are meaningless for reporting purposes.” So, if you feel there is a *chance* you can do better, give it a shot (and if you know you bombed it, just cancel; they won’t care about that either). Hi Dave, yes, it definitely helps. Just found out I’ve been placed on preferred WL at GULC, I guess a bit higher lsat score in my case would’ve let me in. Yes, you are probably right, a higher LSAT score likely would have pushed you over the top. What about taking the Feb LSAT and using it to increase your chances? It works, and the basic advice in this blog applies equally well to using the February LSAT results as June: http://blog.powerscore.com/lsat/the-law-school-wait-list-and-the-june-lsat. Hey y’all, I’m just wondering what a splitter really is. I have a 174 lsat and a 3.68 gpa and according to this chart, that would be a “splitter” gpa at Harvard. Is this really a splitter and how will it affect my chances of getting in? Thanks for the question. And congrats on the 152 to 174 increase–that’s spectacular! So, your GPA is below their 25th and your LSAT is just under their 75th, and as such you are pretty close to what a splitter represents. As far as your chances, it’s not the worst position to be in. Your higher LSAT score is useful to them and your GPA is easier to offset than if you had a low LSAT score. But here’s the problem: Harvard is so competitive that weaknesses like your GPA (sorry to describe it that way; 3.68 is excellent, but for Harvard it’s low) put your chances in immediate jeopardy. Whereas at school like Texas and Michigan you’d likely be an admit (assuming the rest of your app is solid), at Harvard you are quite likely to be waitlisted. With 174s, they have often waitlisted applicants between 3.65 and 3.8, and you are right in that zone. I think that if you apply to the T14 you’ll have a wide selection of admits to choose from, but the truth is that for *any* applicant, HYS are just brutally tough and there are no guarantees. You do have a chance though, and your LSAT score will keep you in the conversation. That’s likely due to limited data on the school, but I’ll double-check that and report back if there was a different reason. I have been told that law schools would consider your major when applying. I am a STEM major with around 3.4 GPA (thanks P chem and O chem) but have around 170. I am hoping to go to schools like Georgetown, etc. Any experience with majors considered as a splitter? Yes, your major will help when it’s from a non-standard law school major (such as Political Science or English). So, you get bonus points by coming from a STEM background. they will also understand the grade crushing created by classes such as organic chemistry. However, these are minor positive effects on the overall scale of things. The good news: low GPAs are easier to offset for law schools than are low LSAT scores, and so the fact that you are posting around 170 vs a 3.4 will help you as far being a splitter. That low GPA will also be tempered slightly by your major, meaning that overall your position isn’t too bad. Every point on the LSAT counts in this position, so you should consider the December LSAT if you feel that you left any points on the table or could still score higher. Do you think that being a super splitter vs a regular splitter makes a difference? Also, I have to imagine that your major and years out of school factor into the GPA consideration (along with a corresponding personal statement) correct? I am a physics major applying with a mere 3.18 cGPA but an LSAT of 178. My GPA is mainly low due to my first two years of school and my GPA for third and fourth year is 4.12 (on a 4.3 scale). I also have an extensive amount of extra curricular. What chance would I have to get into a school like NYU? Thanks for the question! Your LSAT score will really help you here, and your chances at NYU are at least 50%, and probably up to 75% or so. At the least, you have an excellent chance at the waitlist. High GPAs are relatively common, but high LSAT scores are not nearly as common, so this is working in your favor. So I have a couple of questions that I would really appreciate you considering if you have the time. I am very interested in attending the University of Pennsylvania and intend on applying Early Decision. Their middle 50% GPA range is 3.54-3.94. My GPA (as calculated by LSAC) is 3.6 which just barely puts me in the middle 50% of their GPA range. Penn’s middle 50% LSAT range is 163-170. I have not yet taken the LSAT but if I can score 170+ (after LOTS of studying of course) Can this offset my low(ish) GPA? Would this also make me a splitter? Will applying Early Decision be beneficial? My second question is in regards to Majors. I studied Media Studies & Production with a minor in Criminal Justice. Will Law Schools not like these areas of study as they are not typical law school majors (Philosophy, Poly Sci, etc) Will they view these areas of study as too easy? Thank you so much and I appreciate any information you can offer. “Can this offset my low(ish) GPA?” — Yes, no doubt about this. A high LSAT score can basically make up for a low GPA and completely counterbalance it. “Would this also make me a splitter?” — Not in the traditional sense because your GPA is in the middle. But that’s a good thing, not a bad thing! “Will Law Schools not like these areas of study as they are not typical law school majors (Philosophy, Poly Sci, etc)” — Selecting a law school class is like creating a football team: they want people from all walks of life. If the whole class was PoliSci majors, that would be a really bad class (just like if the whole team was QBs, they’d be bad). So, being a bit different as far as your major is no harm at all, and can at times be helpful. “Will they view these areas of study as too easy?” — I can’t speak to this with completely because each school has individual stats on their students from each school, and we can’t see those. If someone from your school/major went to Penn and did well, that will boost you, though. Hopefully that helps–for now your focus should be on the LSAT. That’s the big difference maker you still control, so maximizing your score there is the top priority. Good luck! Hi there! I have a question regarding being a splitter, I have a 178 LSAT score and graduating with a 3.55 GPA due to a bad sophomore year and also transferring my sophomore year to a new school. My freshmen GPA was 3.88, do you think they will take that into consideration along with my other GPA? Also, my goal schools are UChicago, Columbia and NYU, are my chances getting into these schools realistic? I also have a solid amount of extracurriculars and will be taking a gap year to work. Thanks for the question! Your 178 will serve you well here I’d suspect 🙂 Assuming the rest of your app is excellent, your chances are very good for a straight admit to NYU, and about 50/50 between a WL/admit for Columbia, and then slightly more towards the WL side for Chicago. But, it really depends on how the rest of the year plays out as far applicants. Maybe consider an addendum about that transfer year, but otherwise you are in the running!